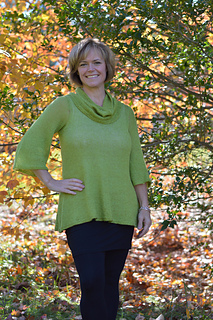 A timeless, long, flowing pullover, knit in one piece from the bottom. The body, as well as the cowl, is knit with the yarn held double while the sleeves use a single strand, lending the piece to transcend the seasons. The cowl will add just enough warmth for those days that start cool but warm up by day’s end. Finished measurements: 32 (36, 40, 44, 48, 52)“ bust and designed to be worn with no ease. Yarn requirements: 1 (2, 2, 2, 2, 2) cones Valley Yarns 2/14 Alpaca Silk or 2 (3, 3, 3, 4, 4) skeins of Miss Babs Alpacacita. Also may hold 2 different lace weight yarns double stranded. If using this option: 1 (1, 1, 1, 2, 2) Valley Yarns 2/14 Alpaca Silk and 1 cone Valley Yarns 8/2 Tencel. Gauge: 5 sts and 61/2 rows = 1” after blocking.